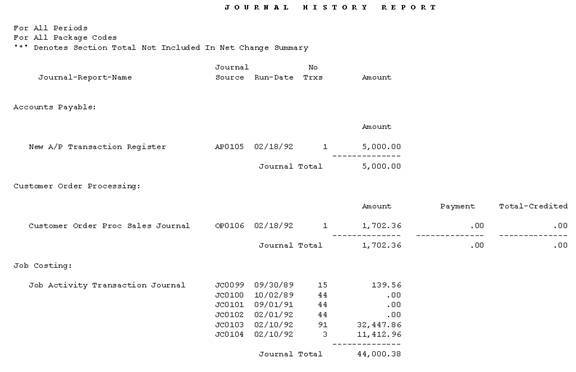 The Journal History Report produces a listing of all journal totals. To maintain journal history totals, the field in G/L Setup must be set to "Y". 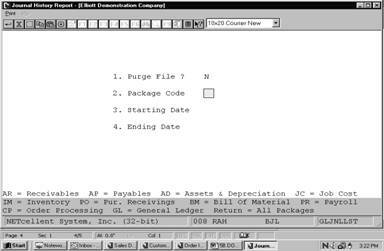 Each posting procedure that is performed for any package that interfaces with General Ledger, a journal total will be written to the Journal History file. This report will show the totals for each posting that has occurred for the range selected. This information can be used as an audit trail back to all the original posting procedures. The information on the report includes: Journal - Report -Name, Journal Source, Run Date, Number Of Transactions Posted and the Total Amount Posted. The report also produces a Net Change Summary for the selected print range. Purging the Journal History file periodically will prevent it from growing extremely large. * The Journal History Report is printed if you answer Y to entry field 1. Print Report ?. The file will be purged within the range you enter if you answer Y to entry field 2. Purge Files ?. * Once the printing of the report or the purging of the file has been completed, the program will return to the data entry screen to allow you to enter another range for printing or purging. Y or N. Enter Y to print the report or N to decline. This field defaults to Y.
Y or N. Enter Y to purge the file or N to decline. This field defaults to N.
2 alphanumeric characters. Enter the package code for which you want to print the report. If you press RETURN for this entry, it will default to All, and journal codes for all packages on file will be printed. A date in the standard date format. Enter the starting date for which you want to print the report. If you press RETURN for this entry, it will default to All, and all date ranges on file will be printed. A date in the standard date format. Enter the ending date for which you want to print the report. If you press RETURN for this date, it will default to the starting date entry.